Mary Garvey, writing from Hightstown, New Jersey to her mother in Ireland. 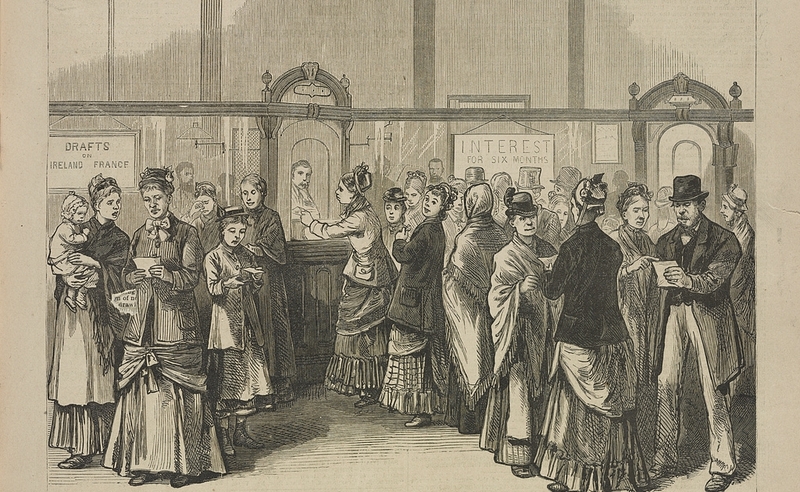 Irish Immigrants withdrawing money back to send back to relatives in Ireland at the Emigrant Savings Bank. I write these few lines to you hoping that you are now and will continue to be in good health when these shall reach you. How is Uncle and how are the children? Do they still continue to be in good health? And how is sister Margaret and brother Owen and Brother Thomas? Do they all still enjoy good health? I was very sony when I received your letter that Brother Owen thought hard of me because I did not ask about him. I did intend asking of him but made a mistake. Dear Mother, I fear that you think that I have forgotten you but this is no the case for I think of you every day of my life. [late and early] The cause of my not writing to you sooner was because we have had sickness in the family that I live in for a long time. I have left the place that I was at when I last wrote you and am now living in Hightstown about four miles from where I was before. I feel very uneasy about you all for fear that you may be sick or dead or that you may be suffering for the want of the comforts of life. 1 am going to send home to you four and I hope that you will not want for any more necessary things, for I will work and earn money enough while God speaks my life and strength that I have asked after him. I hope you wont forget to tell my Uncle for I love him as much as I could my own father and I hope you will give him some of the four pounds for I don’t want to hear of him or any of his children suffering for anything more than I would myself. I should like to have very much my Uncles two daughters Mary and Bessy Elizabeth out here with me for I know that they could make a very good living in this country. I want to know how little Patrick is? And how is John Kay and his family? Is his daughter Catherine a coming to this country? I hope that also Frank Conner and all his family are in good health and also Thomas and Catherine. I want you to tell me in the next letter how all these folks are that I have asked about and my other Uncle’s little Mary and Patrick are? Are Peter Raffaerty and his family in good health? And lastly are all the neighbors in general in good health? I forget to mention Rose and Owen Conner are they in good health Owen and all his family? Dear Mother, I should like to know whether this has been a deer summer. I am afraid that it has been. I want to know also how my Uncle is getting along with his trade? Is he earning plenty of money to support his family if he is not I think he had better come over to this country for here he can make a good living and perhaps get rich. I like to be in this country very much great deal better than in Ireland for Ireland is a poor place and I would not live one weeks in it again if I had money to take me over here. Dear Mother, I should like to have you come over here very much if you think that you would be strong enough to stand the voyage. I hope you will leave that starved country and come over here in the spring. I am happy now but I should be still more happy if I could see you once more and have you here with me. [Crossed out: But I don’t want you to come if you don’t think of yourself strong enough to work]. I want you to write soon and let me know if you will come and if you do what about what time in the spring I may expect you. When you arrive in New York you must go to Henry Murtha’s No. 7 Harvard Street New York and let me know from there by letter so that I can come to you or Id send for you to come out here. If you don’t think yourself able Id come I want my sister Margaret to come. If Mother is dead I want the money to go to my sister Margaret and if she is not it is for her and she may do what she pleases with it. I have to tell you the death of Henry Murtha’s wife. She was buried on Good Friday last. I have not seen any of my comrade girls since I left New York. I have been very lonesome since I have seen no one that I knew. I was very sorry when I heard the death of Uncle Jimmy. I live in Hightstown as I said before with R.M. Smith Esq. It is a large family. He keeps a hotel and quite a large one too. I like it here very much indeed. I get 5 dollars a month which is two more than I got at the other place. There are 6 children and Mr. And Mrs. Smith beside all the boarders and help. The children are two girls and four boys. The babe which is a little girl has been very sick for the last three months so that we have not thought that she could live but she is getting better now. She is very fond of me and I of her. There is a nice young Irish man in the employ of Mrs. Smith. his name is Noble Colter and there is an Irish girl living opposite here in another Hotel named Hannah. I am little acquainted with her but she appears to be very nice. Dear Mother, it will be necessary for you to take some provisions with you that you will not be likely to get on sea. They are some salt heron some fresh eggs and some potatoes. These will be all that you will need for you will get m(tear in the paper) ship of everything else than you can use. I am anxious to know if Brother Thomas is living for I am afraid that he is dead. You will tell me in your next letter. I was not sick on sea at all. I thought it was very pleasant until the last week or two when I became tired and began to want to see land. I hope you will fare as well as I did but I am afraid that you will not as you are more aged. I hope you will let me know when you are coming about two months before you start so that I can procure you a good place near by me. If you need more money to come well you must let me know in the next letter so that I can send it to you in time. I want very much to send a present to my Uncle’s daughter Mary but I have no way of doing so at present but hope to the next time I send anything at home if not a present the price of one which will be just the same. The boys get ten dollars a month for driving stage in this country so of course do not get as much as this but according to their goodness and age. Girls get from three to 8 dollars a month according to what they can do. Cooks only get eight dollars a month. I get good wages for what I do. Dear Mother you had better get you a good warm shawl a red plaid one before you come over. The different kinds of victuals that we have on the table every day are beef, pork, lamb, chicken, ducks, turkeys, veal, sweet potatoes and Irish potatoes, cabbage, onions, beets, tomatoes, com, beans, peas, cranberries, apples, pies, puddings and many other things to tedious to mention. The prices of eggs are a shilling a dozen, beef 10 cents a pound ham a shilling a pound, butter 14 cents com, oats flour three dollars for a hundred potatoes. Now Dear Mother l must close for l that I have written you a long letter (page tear) I am afraid that it will tire your patience. How is little Ellen? Is she still living? May love to you my Dear Mother above all and to all the rest of the family. Good bye, I remain your ever loving daughter Mary Garvey. What does the letter suggest about Mary Garvey’s decision to leave her home to move to New Jersey? Based on what you know about migration today, do you think these motivations are shared by many people on the move? What does she want her mother to know about her journey to the United States? What does Mary’s letter tell us how she felt about being away from her family for the first time? How would you help someone who was homesick?